Darn it, despite my best hopes to get in one lil' after-work HillJillys road ride before I hit the open road myself, I've plum run out of time. I'm headed out for a lil' summer road trip--one that will include plenty of singletrack time on the mountains of Flagstaff and the red rocks of Utah. When I get back, there are some great things in store for the HillJillys. Cambria has a new hire, Lindsay, who will be bumping up the women's program there and helping out with HillJillys rides and clinics. Looking forward to introducing her to y'all. 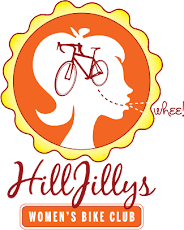 Note: if you've been to a HillJillys event (ride or clinic) and haven't yet received your Cambria discount card, be sure to email me your mailing address and I'll get one out to you when I return. Thanks for the intro Kim! Have an awesome trip, utah ROCKS! Anyhow, this is Lindsay here, if anyone wants to ride in the meantime, you can email me at lindsaylamontagne@gmail.com, can't wait to meet you all!